I take pride in bringing the best dog waste removal services to our city. As the owner of Oklahoma City POOP 911, you have my promise that we’ll leave your lawn cleaner and greener than it’s ever been. Our goal is to give you more free time with your pet, because that’s what life is all about! 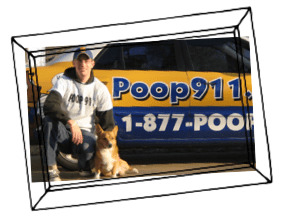 Just as Oklahoma City is the capital of the state, Oklahoma POOP 911 is the capital of poop removal services. We’ll scoop your yard with precision on a schedule that works best for you. From dog walking to patio cleaning, our affordable services can be your new best friend. Our technicians are in the business of helping people enjoy their pets to the fullest. Dressed in uniform, they remove pet waste year-round and will even clean and deodorize decks, patios, and dog runs. Just look for a door hanger and know the job’s done. Let’s keep our Oklahoma City neighborhoods beautiful! Get a customized quote for services to suit your community’s needs. We can install clean-up stations, restock dog waste bags, poop scoop designated areas, and more. Vets (and cats) agree: It’s a good idea to scoop the litter box once or twice a day. Because finicky cats prefer their bathrooms spotless. These guys are seriously the best at they do!! Just started using the service and it’s been great! Not having to worry about picking up dog poo is wonderful! They did a great job. Above and beyond expectations. I’m so glad I found this company. Prompt, courteous and thorough. So glad this service is in OKC. I believe it is a fair price for initial clean up and maintenance. I have more than one dog and the chore easily gets away from me, they took it off my to do list and out of my yard. Highly recommend. It's one less thing I have to do in my busy life and it's affordable! Long time customer. Excellent service and they’re very good about contacting if they have to reschedule due to snow or ice or other events. Very reasonable prices. I highly recommend them. I love it. We are an older disabled couple and have two fairly large dogs. These guys have done an excellent job. This company has reduced my stress level and my back yard is a pleasure again. I can't tell you enough about the excellent service they provide! It's great not walking into a yard filled with poop, and they even take it away for you. Our lawn guy really appreciates it too!